Central Texas College (CTC) is one of the institutions that has a large online learning program. They use the Blackboard portal which gives students total access to all course materials and resources. CTC is anxious for students to succeed, so they provide instructions so that everyone who is registered at the school can easily access all the information they need. This article lists the details of the steps you need to follow to login and view your courses, and to gain access to the resources you can use if you have problems. 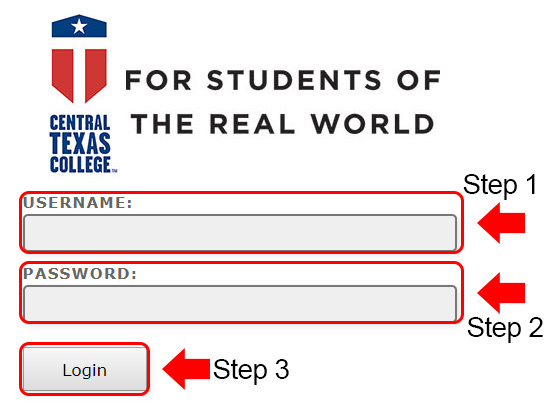 Once you become a registered student and create an account, the login process is fairly straightforward. 1. Go to the CTC Blackboard login page at ctc.blackboard.com. 2. Enter your user name and password as directed. 3. Click the “Login” button. First time users are given instructions on the login page as to how to determine a user ID and how to create a temporary password. Once you login the first time, you will be asked to create a permanent password. CTC has extended access so that you may login from anywhere that is convenient, using your favorite mobile device. CTC makes mobile access even more convenient for you by offering Apps that are compatible with both Apple and Android devices. With these Apps, you not only get all your Blackboard distance learning materials but you can open My WebAdvisor, My Notifications, and CTC news and calendar. Open the browser on your phone or other device. Enter www.ctcd.edu/social-media/ctc-mobile-app into the address bar. Scroll down the page and click on the “Google Play” icon. Choose Central Texas College and install the App. Open the App and login using your WebAdvisor credentials. Scroll down the page and click on the “ITunes” icon. Follow the instructions to download. The Blackboard staff recommend that you use Google Chrome version 36 and higher or FireFox version 31 and higher for maximum results. When you enter the login page address, be sure that you use only the URL provided above and not www.ctc.blackboard.com. This will take you to a very different location. If you forget your user name, use the “Find My Username” link on the login homepage to recover it. The CTC Distance Learning homepage (www.ctcd.edu) provides a link to the student Help Center on the far right at the top of the page. for any other issues, you can get 24/7 Blackboard support at 1-866-350-4729. CTC encourages your participation on Facebook and / or Twitter.